2014: The Houthi coup against the legally appointed President Hadi, instigated in part by the guy Hadi replaced. Nasty multi-sided civil war ongoing. 2016: The attempted coup by a secular military against a populist, increasingly anti-globalization Erdogan in Turkey. People died, dissidents fired, Erdogan emboldened and isolated (a dangerous combination). 1994: Hutu President of Rwanda assassinated via SA missile. The consequent conflict is called the Rwandan genocide. These are what violent transition of power looks like – some succeed, some fail, some may quickly become irrelevant, most leave lasting scars. In all cases, people die. People dying is what ‘violent transition’ means. Contrast that to Techdirt’s example, where Trump’s election has no resemblance to a peaceful transition of power because of … leaks from inside the government. Oh yes, very violent, those leaks. The fact that we haven’t had any coups or serious assassination attempts following the divisive election is actually remarkably positive evidence for the resilience of the rule of law and democratic institutions in the United States. Yet there is a lot of talk about impeachment and illegitimacy. Techdirt’s clearly absurd sentence was the impetus for me to ask: Why? A typically grounded source lost all sense of grounding – and on reflection it wasn’t alone. Unsurprisingly, presidents are fairly popular among their constituents – look at that row of points on the right. Even less surprisingly, presidents have little support among the opposition voters. Trump is NOT an outlier among Republicans, but is an unprecedented outlier among Democrats. (I can’t resist the aside that Obama did fairly well compared to his predecessors, another indication that the ‘bigoted Republican’ narrative really doesn’t hold much water as far as explaining the election outcome.) This unusually partisan unpopularity says something (maybe, polling being what it is). What it says is not immediately clear (statistics being what it is), so I offer two opposing theses – Trump’s critics need a little more perspective, or the Republican party is increasingly deranged and the president acceptable to today’s typical Republican is too crazy for the usual 30+% crossover support. To distinguish the two, I am going to cover Trump’s policies so far, and I fear that ‘radicalizing Republicans’ conclusion will be decidedly non-trivial. Immigration: The big topic, it seems. As I argued in my post-election post, U.S. immigration policy ebbs and flows over the decades. As I also argued then, immigration tends to be deeply related to trade isolationism, the popularity of which also shifts with time. The un-interrupted successes of free trade (and then, as per Techdirt, “free trade”) made some correction inevitable. Political science offers both the cloud and the silver lining on this subject, as a recent paper (Peters, 2014. “Open Trade, Closed Borders”) argues that free trade and free movement of people should be inversely related. From this argument, either free trade or free movement was inevitably going to have to go, but optimistically, it will be difficult for Trump to make restrictions on BOTH actually stick. If the reader does not find Political Science declarations on the deterministic forces behind national policy to be overly convincing, there are reasons to see Trump’s immigration policies as relatively unexceptional and relatively predictable. I find that immigration is getting more anger than free trade, so I’m going to specifically unpack that side of things a bit more. As I’ve argued before, the evidence (foreign born population rising about 13% again) suggests we’re due for another immigration ebb, and put within that historical context Trump’s infamous seven countries policy is rather tame. The last time the U.S. did this it was if anything even more directed at a particular religion (Catholics) and covered several of the largest immigration sources (Ireland & Italy among others). In comparison, if the goal of Trump’s executive order really was to produce a “Muslim Ban” it’s doing a fairly terrible job of it, as the list does not include Pakistan and Egypt, both of which also rank pretty highly on the immigration source list (aggregated over 26 years, which could strengthen or weaken this claim I suppose). More than such missing sources, there also exists a far better explanation for the list than Islam. Libya, Syria, Somalia, Yemen, Iraq, Sudan – these are all countries where we like to do drone strikes and special ops missions. Plus Iran, because we don’t like Iran, I guess. I feel like that quaint tradition of declaring war before using military force would do a tremendous amount in terms of clarifying what the government as a whole has actually been trying to do with the immigration restrictions. Many, MANY more would be affected by the proposed increase in the H1-B visa cutoff from $60k to $130k – but that isn’t actually because of Trump at all! The H1-B reform is a bipartisan effort that’s been kicking around since that hey-dey of Trumpian xenophobic excess that was … 2007! Now there’s an argument that while the long-unadjusted $60k encouraged abuse, $130k might be a bit high, but there’s a general agreement (except among the large multinational corporations) that the system as it stands needs fixing. And, um, that’s it so far on immigration. Everything else I’ve run across is rumors and pre-emptive worrying. Feel free to let me know if I’ve missed anything, but as it stands I see policies that are probably hasty, poorly managed, certainly unjustified in places, but hardly insane, unthinkable, or even unprecedented. That doesn’t make them wise or right, but that is a different matter, one which should, in principle, be amenable to calmer criticism than I’m seeing so far. Culturalism: On this topic, people start muttering conspiratorial things about Bannon, that neo-Rove-ian power behind the throne. While I want to point out that ascribing the ideologies to Bannon is often used as a sort of genetic fallacy to dismiss the ideology without actually engaging the details, various reports nevertheless allow a decent overview on what people fear from the Trump ideology. Having examined these reports so I’m not impressed or surprised, and don’t even see any of the novelty one would expect from a populist revolt. In fact, the best summary of Bannon’s views is to see them as Huntington’s “Clash of Civilizations” with a little added nationalism. Huntington died (in 2008) feeling rather rather good about his life’s work as he predicted (back in 1996) that Islamic/Western tensions would rise, so his worldview at least has that going for it. Maybe not a lot else going for it, and maybe not even that prediction for the right reasons, but it’s something. For my purposes, the reader should know that Huntington was a lifelong interventionist Democrat, the adviser to multiple presidents, and highly respected both within the halls of power and academia. The difference between Bannon and Huntington is that Huntington writes with a refined ivory-tower birds-eye view of the upcoming clash, while Bannon has picked a side and is wading in on behalf of what Huntington called “Western Civilization”. In terms of feeling a global culture war, Bannon’s/Trump’s views not only aren’t novel or unprecedented – they even found a home among the Democrat strategists! As with immigration, this argument does not claim that the critics are wrong, but is an argument against Trump representing a novel idea or even a radical shift in American ideology or foreign policy. Isolationism: It’s not clear how (if any) militarily isolationist Trump is, beyond his statement that the other NATO members aren’t pulling their weight. On this point he is entirely accurate; by treaty, NATO members are required to pay 2% of their economy toward defense, and only five of the NATO countries presently meet that obligation. (For comparison U.S. spending is at 3.67% suggesting the opposite problem, but that is a matter for another time). The rest of the NATO members are best described as giving the NATO treaty about as much respect as Trump is willing to give trade treaties. As for the rest, he’s upheld the Russian sanctions (fairly strong empirical evidence AGAINST the Putin Puppet narrative by this point), hasn’t immediately scrapped the Iran deal despite several provocative statements and missile launches, and has even followed the monotonously familiar U.S. policy on Israel (to wit: campaigning on moving the embassy to Jerusalem, then failing to follow through on that while mildly and ineffectually criticizing building beyond the established borders). As the pattern of this essay has already made clear, I find ‘actions speak louder than words’ to be a useful political heuristic, and so, for all Trump’s on-camera foreign policy incoherence there’s really little to see here either. From my point of view, ‘more of the same’ foreign policy is actually highly damning criticism – but tragically not one that singles out Trump. Appointments: There’s a problem with the analysis here, in that many candidates aren’t accepting nominations, making it difficult to judge Trump’s actual intent by the eventual outcome. That being said, Gorsuch is more popular among Democrats than Garland was to Republicans, and is acceptable to a majority. The same poll suggests Tillerson and Sessions also have plurality support with healthy margins. DeVos was particularly unpopular, but I never quite got why she hogged the news – money in politics, sure; lobbying, yes; voucher programs, what? The voucher program support, from where I’m standing, got FAR more press than the lobbying issues – do the article writers think people hate voucher programs more than lobbying? Besides a rhetorical error, it seems the data isn’t on the anti-voucher side either. The typically very scientifically respectable (and very anti-Trump) Slate Star Codex cited a recent study that concluded that vouchers were a significant success in New Orleans. Also via Slate Star Codex, a plurality of economists think vouchers are a good thing (admittedly for whatever dark and arcane reasons economists have to conclude anything), and independent of the value of that expert judgment, the New York Times found a way to be aggravatingly misleading in publicizing that result. To summarize: Gorsuch is respectable, Tillerson & Sessions not respectable but popular, deVos’s voucher program probably better than not. And so it goes. Miscellaneous Domestic Culture War Issues (Abortion, Bathrooms, &c.): Well, without getting into the details, it’s difficult to find a more divisive area of policy. Shocking, really, that a Republican president would hew to the party line! Thus: not unprecedented, not novel, not drastically different from prior Republican efforts. I think the best way to begin the conclusion is to note that, since this is Trump we are discussing, his socially conservative actions ARE a little shocking. One of the most common and deeply seated doubts about Trump during the primary and campaigning was that he was the ultimate RINO, a New York socially liberal wolf in sheep’s clothing playing the long con on U.S. Conservatives. Since by my own (deeply informal) survey of reading opinions during the election, I can say this was highly effective in discouraging people from supporting Trump, particularly in the early and middle periods of the election. Yet, despite the observed power, this line of attack was pretty much never used by Clinton or Clinton supporters and was only rarely covered in the media, completely vanishing toward the end. Consider the might-have-been if all the gritted-teeth Trump voters were more suspicious and stayed home instead! Thus the question: why not? I think because it would have required framing liberal policies in a rhetorically negative manner, which demands a certain amount of cognitive dissonance or unpleasant flexibility even if done for strategically sound reasons. As an extension of that explanation, the overall campaign strategy was to paint Trump as an unelectable nutcase, so any signs of flexibility or compromise on Trump’s part had to be squashed in favor of the idiot bigot stories which, admittedly, Trump often made pretty easy. Now, of course, Trump has actually WON, and the unelectable nutcase narrative is so prevalent and so deeply ingrained that an unknown blogger who doesn’t much care for Trump is nevertheless partially defending him in the vain and utterly egomaniacal hope of producing a more constructive national dialogue-… Um, I mean: that Trump’s only political options are to a) compromise, thereby losing his current base and gaining no support because of how detested he is, or b) become the most effective and (in actions if not thoughts) principled Republican president in a generation and thereby maintain his current support. As per the NYTimes, the Democrats are declaring total war on Trump, so I guess the hope of compromise is dead. Lost opportunities for compromise aside, I conclude that, in the grand scheme of things, Trump’s actions aren’t anything special. What may be novel is the speed at which he has managed to move and the sheer volume of sound and fury he produces. The former I blame on a seemingly endless succession of Presidents pushing executive power, culminating with Obama’s “Phone & Pen” and Trump’s lack of experience with the normal process. If Trump’s populism is the sign of something going terribly wrong in the beliefs of the country as about half the country feels, Obama’s statement should have been understood an even clearer statement that something has gone terribly wrong institutionally. As for the sound and the fury, well, Trump’s personality and genius for sounding like an idiot explain a lot. 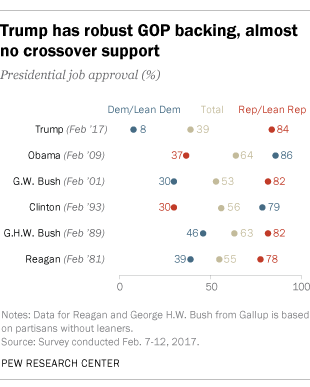 To revisit the crossover support poll results I must conclude that, to the extent his Democrats believe Trump is so much worse in goals and policies than any other Republican president, they are wrong. I’ll be first to say that Trump speaks rashly, sounds like an idiot, and is often terribly wrong on matters of fact. I’ll also say (again) that his actions are hasty, and not particularly well thought out (again, not that one can really expect anything more from a person with so little experience in the long, long sausage-making process). Yet for all that, his actions aren’t nearly as unthinkable as his critic’s reactions to them seem to suggest. Since the hatred really is focused on Trump, and I’ve so far concluded that the hatred is out of proportion to the policies, I must conclude that it is Trump’s distasteful manner and personal life are leading people to overreact. Thus, as I stated so many paragraphs before, Trump’s worst political sin is that he is Donald J. Trump, more than anything he has done so far or, at this rate, ever will do. Plenty of people have talked about it. On Twitter. Often with its very own shockingly popular hashtag. You’d think everybody would realize by now that they shouldn’t post assassination threats on twitter. People who do that tend to get visits from the secret service, which is an organization not often complimented for its sense of humor. Back to the point: depressing willingness of people to condone violence aside, so far I haven’t heard of anybody actually taking a shot at the President. Pet peeve on this: Trump didn’t pick the countries – they were selected by Congress in 2015 in a law signed by Obama in 2016, with additional countries added mid-February 2016 by executive and/or executive fiat in the instrument of the DHS. Trump’s order was, as best as I can tell, a temporary (90 day) extension of pre-existing law that (with additional slightly longer block on refugees). Maybe the outrage should have been saved up for his permanent and broader immigration policy such as he keeps threatening to unveil? In any case, the reporting on this has been really quite terrible, as the exact details of what is being done keep getting buried amid a bunch of unhelpfully broad defenses of immigration in general. Consider by way of example, a NYTimes article on the subject that slides sleazily between travel bans and visas, between doctors from the seven countries to ‘foreign born doctors’ in general, and generally muddies the waters between the particular that has been implemented and the general they’re afraid Trump might eventually get to. It feels evasive, and I don’t like it. Politico has some useful bits but as a journalistic effort the good is rather overshadowed by a notably strained attempt to connect Bannon to the ‘neoreactionary movement’, a poorly defined category for monarchists and other advocates of benevolent (and decisive!) constitutional dictatorships, i.e., the “Trump is a fascist” narrative which is at its best pre-emptively cautionary and at its typical level pure Godwin’s Law slander. As far as I can tell, the neo-reactionary “movement” consists of two actual thinkers, a handful of hangers-on, and a lot of trolls – in other words a cultural non-entity and only good for being mocked on Twitter or used for ‘friend of a friend’ type discrediting games. On the subject of such smearing, the NYTimes article I linked to above writes the following: “While [Bannon] is certainly a hard-line conservative of some kind, the evidence that he is an extremist of a more troubling sort has generally been either massaged, misread or hyped up.” The Grey Lady’s journalistic standards aren’t entirely dead yet, though the revenue funding decent reporting is, I gather, still sinking. The replacement of National Security Advisor Flynn is a good example. The first offer went to retired Admiral Harward, who looked really awful from my point of view. However, he said no. Next up appears to be McMaster. McMaster is another military type, which I find distasteful in the context of National Security, but at least seems to be another man in the vein of Mattis – a vocal dissident and critic of recent US foreign and military policy, and of the career-focused types that were either too stupid to realize various military goals weren’t achievable, or so unprincipled they were willing to throw lives away in the name of being yes-men. Now, which of these is closer to Trump’s intent – the revolving-door ex-Admiral working for that apotheosis of the military-industrial-lobbying-complex called Lockheed Martin, or the man who is widely suspected of having been denied promotion, possibly because of his willingness to criticize his superiors? I really don’t know, and I have to entertain the possibility that Trump’s (or his staff’s) criteria for making an offer is orthogonal to anything I care about. (Side note: in Googling forgotten references, I find that Brietbart and Slate both have good things to say about McMaster – I may die of shock.) I’ll also add that, sadly, the military predominance in Trump’s advisers is predictable. The military leans right, and nobody in the establishment (i.e., center) or left-of-center are willing to work with him. This limits his pool of experienced government leaders. By itself the evidence that Gorsuch is reasonably popular among Democrats suggests the hatred of Trump is not a reflection of Republicans or even Republican policies. To the media: ouch. I can only assume that this is yet another reflection of trust in reporters and trust in Trump being in a neck-to-neck race to the bottom. The media’s cringing over Tillerson & Sessions is just one of many messages the media no longer seems to have the credibility to disseminate. Michael, I appreciate thoughtful and balanced commentary about Donald Trump, much as it pains me to read it. However I think you, like other commenters striving to be thoughtful and balanced, end up using a double standard: Trump is so far off the wall so often and in so many areas that you focus specific areas that lend themselves to rational discussion, while politely ignoring the craziness. NB I think freedom of speech would be so much better with a slightly larger font size. I feel somewhat safe in not listing the criticisms of Trump because so much of that is already out there. Broadly speaking, there’s little new I can offer in that direction. However, since there are some things that bother me about the Trump administration that few others seem to care about it may be worth a post at some point. To respond to your criticism in more specific terms: the trouble with double standards in politics is that they tend to run in two directions, and so far on the issue of abuse of executive power I tend to think Trump has been an improvement over Obama. So far, of course – Obama’s ‘pen and phone’ tendencies peaked later in his term and there’s plenty of time for the same to happen for Trump. I’ve also discovered I’m not alone in thinking this: http://www.nationalreview.com/article/445185/trump-less-authoritarian-obama In short, it’s not that I’m happy with Trump as I am annoyed by the instrumentalist double-standard with which attacks on Trump have occurred. There can be NO truly effective pushback against Trump’s (ab)use of executive power until the critics admit that it isn’t just a problem with Trump. As long as they criticize the man rather than the state of the office, the focus will remain on removing the man and putting someone into power whose executive orders the media can go back to ignoring or, even worse, complimenting. There were, briefly, some signs of that awakening, but not enough. Instead the typical headline is “Trump can’t be trusted with [presidential authority/nuclear codes/Twitter].” Note precisely what that “Trump can’t be trusted” narrative says: it’s not that presidential power can’t be trusted, but that Trump AS AN INDIVIDUAL can’t be trusted WITH it. This is a terribly disturbing violation of everything the checks and balances system was supposed to achieve. The popularity of this narrative does far, far more damage (or at least indicates far more existing damage) to U.S. political culture and the Constitution than anything Trump has achieved so far. As for the specific element of the free press I’m so far cautious but not yet worried. Our previous president talked the talk, but made an unprecedented effort to bend the force of law toward punishing reporting he didn’t like. (Those links are also two rare, shining exemplars of taking the OFFICE of the presidency to task rather than the person.) Trump so far has talked a lot of bad things about reporters but, continuing my principle of judging by actions rather than words (and my goodness does Trump have a lot of hot air), I will not be concerned until he follows the prior president’s precedent and tries to put someone in prison for leaking information. As it stands Trump hasn’t yet BEGUN to stop the leaks and there’s precisely zero chance of the press just rolling over and giving up their criticism of Trump – in fact, his statements seem to energize them, sometimes (as the above essay hints) beyond the proportional and factually-defensible level. So far, then, the ‘enemy of the people’ line is an empty threat. As far as I can tell what he has actually DONE so far is to refuse to answer questions form reporters he doesn’t like – but as ugly as this is it’s far from a novel strategy. There’s a long tradition of inviting particular reporters for private or restricted meetings to reward them with advance notice of certain items so that the first headlines to hit the streets are positive ones – as well as ignoring questions one doesn’t like in more public fora. Trump’s novelty is in making such a public spectacle of his strategic relationship with journalists. As it happens there are good strategic reasons for this spectacle, and I think the strategy suggests that the real problem with reporting in this country is somewhat more fundamental than Trump. As I cited in the article above Trump is, if anything, MORE popular than the media. One of Trump’s (few) real consistencies is his criticism of the media, and this statistic explains why he does so – the media is so unpopular that a lot of people LOVE to watch Trump take them down a peg, interview after interview, press conference after press conference. Even if they don’t like Trump, they pull out the popcorn when he attacks CNN. Is Trump’s approach to the media and the population’s response to said attacks bad for the institution of the free press? Almost certainly. BUT, this is all happening because for one reason or another the fourth estate had ALREADY lost their moral authority. It’s not just that he can criticize the media, Trump can safely ignore him too! There are YouTube videos criticizing CNN that have more views than the Wall Street Journal has daily circulation (and WSJ is a close #2 after USA Today). There are individuals discussing the news with minimal production values that regularly get half a million views for videos with sufficient length to call into question the ‘internet generation has short attention span’ theory. The scale of the ‘alternative media’ on all sides of the political spectrum is, dare I say, “YUGE”. Trump can get the populist mileage out of attacking the media without risking his narrative access to the population. He doesn’t need the media and never has. Consider: Clinton outspent Trump tremendously in traditional advertisements – Trump spent a substantial amount of his minimal advertising budget on internet outreach. I won’t say the traditional media is irrelevant yet, as so much of the internet news is built on clips and commentary of it, but the reach, influence, and trust of traditional news sources is shockingly low and, based on subscription numbers, still shrinking. As a final note, I hadn’t heard of that play, but reading the summary makes me think I’ve seen a film based on it, namely The Fool, 2014. I also bumped the font size up by 25%. Hope it helps!